The photo above is of Oktavia, taken during part of this photo session. Instead of off-camera flash in a softbox, I used bounce flash for clean open light on her. The out of focus background is a piece of artwork – a pointillist Mickey Mouse. I thought it might be a cute idea to place her in front of it, and have the ears barely discernible. Mickey’s face then creates a kind of halo around her. There is some ambient light coming in from camera-right. The first step is creating a JPG created from the RAW file that has correct exposure, decent contrast, and pleasant white balance. When I am done retouching the image on this layer, I create a duplicate layer of it. 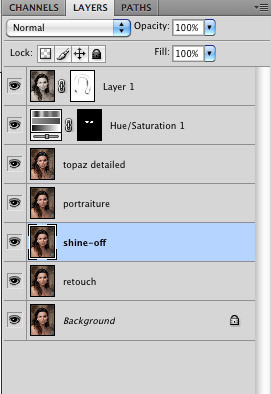 If I feel it is necessary, I run a Photoshop plug-in called Shine Off on that duplicate layer. I rename the layers as I progress, so that I always have a clear idea of which layer is which, in case I need to back-track and delete a layer. Or duplicate it. I create a duplicate layer of this one, ready for a next step. Use Shine-Off to reduce specularity on skin tones. Use code: neilvn for 10% off. On the duplicate layer of the Shine Off edit, I run Portraiture. This too is one of those plug-ins that made a huge difference in my workflow for portrait photography. 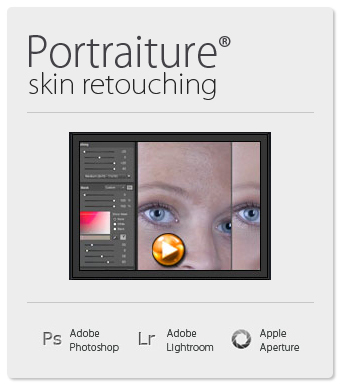 The Portraiture plug-in renders skin smoothly. Too many photographers run Portraiture aggressively though, giving that plastic doll look to skin. Not good. I do run it at 100% on the defaults, but we’ll change the opacity later on … and still add a twist to the proceedings. We’ll keep it at 100% for now, and create a duplicate layer again of the Portraiture layer. Now here’s the twist. The previous layer was over-smoothed, but with this layer, we over-enhance the local contrast by running the ‘Detailed’ action in Topaz Adjust. The photograph will look quite heinous at this point, but we’re going to use it as a ‘Soft Light’ layer, and then pull the opacity down to 10% or 20% or somewhere around there. It depends on taste. This just punches up the contrast and saturation a bit. This step in a way returns some of the nuances we might have lost with the Portraiture step. The photograph should look pretty good right now. Now we pull the opacity of the previous layer (Portraiture) down to taste. I usually settle for around 50% but you can see what you like. Perhaps more, perhaps less. From here on, I might or might not do some further editing on the photograph. It varies, depending on what I want to achieve, and how much more time I want to invest in a single image. For this photograph, I removed a blue-ish tint I saw around her eyes. Then as a final step, I added a black-and-white version of the photograph as another layer, and blended it as an Overlay layer at reduced opacity. It changes the contrast in a way that I like. However, I brought back some of the detail in the darker areas of her hair, by brushing it in with the layer mask. This is obviously not something you’d do in a high-volume workflow, but it does work well with individual portrait images. And of course, all this is a matter of personal taste. I leave steps out, and change opacities as I please. It’s all wide open to interpretation. Finally, the comparison between the first retouching step, and the final image. Here is the SOOC image, with only the default RAW settings applied. Les … most of the photos from couple’s sessions that are on my Facebook page, or series of images from one session that I have posted here … are usually just done as part of my RAW workflow with nothing special added. Maybe a Soft Light layer at 20% of I need the image to have more pop. Great information Neil. I just started evaluating Topaz Adjust so I was very interested to see that you used it after Imagenomic Portraiture (which I love). I’ll give that a try, thanks. 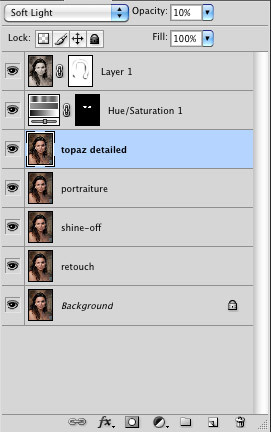 My workflow is very similar, but I never use Topaz Adjust on people pictures….I tend to use an action called “Punch out!!! '” (TRA actions) – at about 15% opacity, and also use Nik Pro Contrast to adjust contrast. Finally – I run a sharpen as well. The Topaz Adjust 4 link isn’t working for me. Thank you for the interesting insight into your workflow. I fixed the link now. Thanks! Why do you convert to .jpg before processing in PS? Is it faster to process? Or just personal preference? I’ve always opened my RAW images from LR as is because I thought that editing .jpgs was more “destructive”. Sarah, the more extreme (ie destructive) changes are the changes made to exposure and WB. This is what I change in the RAW file. So by the time I pull the file in for a final sweetening, I just need the JPG. I don’t bother with a TIFF file, since they are too large for most uses, without a huge benefit to me. Also, at some point we do need to bring the file in to Photoshop for some final editing. For that we need a JPG or TIFF. Not every edit can be done on the RAW file itself. Dude! With pretty much every blog entry you make, I respect you more and more. With so much of today’s photography being pushed to the point of over the top, hyper-real effects, your work achieves a subtley and naturalness that is just awesome and sets you apart. Keep the advice coming … you give me a lot to aspire to. BTW – I’ve got my fingers crossed that you find yourself in the California, Bay Area leading a class or seminar in the not so distant future. Rob .. thank you for much for the compliments! Bes thing re workshops, subscribe to the newsletter or check in here regularly. If something comes together wrt the workshops elsewhere, I’ll definitely announce it. i’d like to see the “before” image for comparison :) thanks! the SOOC image, with only the default RAW settings applied. I always look forward to catching up with your exploits in my lunch break at work. 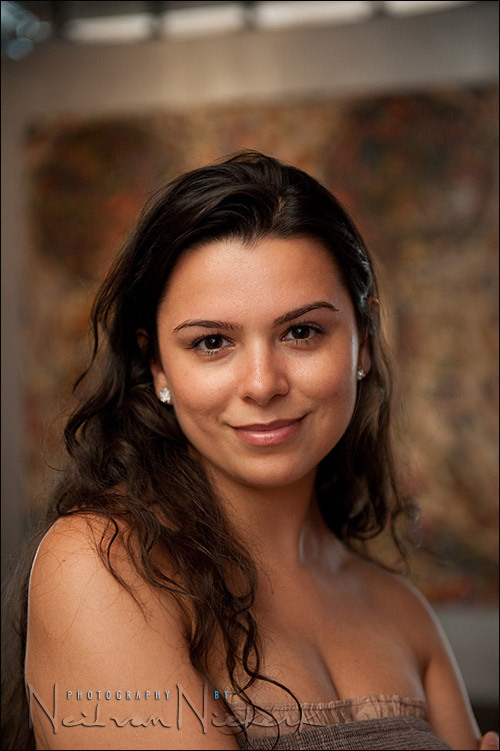 I use Imagenomic Portraiture on a lot of my female model shots. At default but then adjusted to taste with the opacity toned down. It is an absolute gem of a plug in! I was very interested to hear about the layer where you add in a mono copy of the file for contrast change. Can you possibly expand on that or should i be able to understand how it is dealt with from your narrative? Duncan .. it is just something I tried one day, and liked the effect. No more reasoning to it. I wouldn’t be surprised if some Photoshop gurus were to point out that there was an easier way to get similar or better results for the same idea. As mentioned in the article, it is something I try on rare occasion. I liked it this time. Just follow the description. your work is beautiful as usual but she is STUNNING………. So each layer above the background layer contains the previous layer’s effects? For example, the “shine off” layer is the “retouch” layer with the shine-off effect applied. 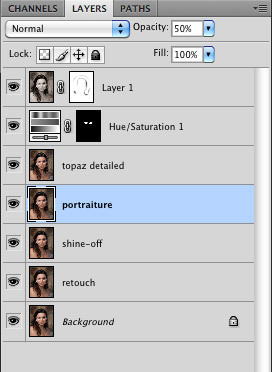 Then, you duplicate this layer and name it your “Portraiture” layer, where you run Portraiture. I was wondering what order to apply the effects. Thanks. Portraiture at default settings is fantastic, although I didn’t add the soft-light layer at 10-20% opacity. Also, for those who have Lightroom 3 and Photoshop CS5, the RAW engines are identical, so when you select “edit in Photoshop” from LR3, it can pass the LR adjustments directly to Photoshop. Only when you save this image in Photoshop does it save the changes back into LR as TIF. From a workflow perspective, this is faster than saving to JPG, but you will end up with a large TIF file. Your results are just gorgeous. I thank you so much for sharing your workflow on this. Excellent, never heard of shine off looks good. Great post as always. Thank you for your incredibly inspiring website. 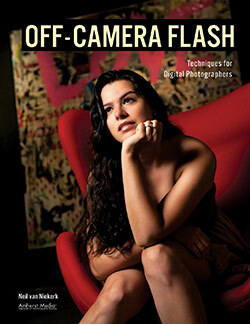 I purchased and received your book “On-Camera Flash”. It has absolutely changed the way that I see lighting. The effects that you create are phenomenal. It is such a relief not to have all the off camera paraphernalia. Your simple home made snoot works wonderfully. 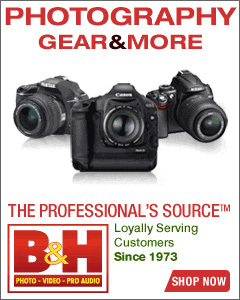 It was a problem getting the CTS gells in South Africa but B&H Photo in New York were happy to send them. I so appreciate you sharing all that you do. It inspires both beginners and professionals alike. You are a master at what you do. Thanks for being so generous about passing on all your knowledge. 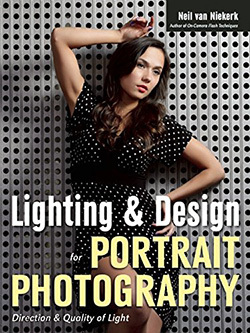 I would highly recommend your book to all photographers out there. Again many thanks. I notice that face in the edited copy is skinner and the width of the image ( of the edited copy) is not as wide which produce a more elongated face. I wonder if you do Transform > perspective step on the final image? Did I get this observation correctly ? Roy .. nope, no Transform used on the image. It must be an optical illusion of sorts with the change in the aspect ratio. I went from a 2:3 aspect ratio to one that is close to 4:5 aspect ratio. What about the skin tones ? Do you do it with a correct exposure only or do you balance it with LR using a method of yours ? jcdae .. nothing specific that I do for skin tones. It is a matter of being careful about the quality of light, and working with a calibrated monitor when editing. There is a fair amount of leeway in what is acceptable skin tones though – we don’t work with nearly the same stringent requirements as commercial photographers would. I also prefer my skin tones warm .. sometimes veering too far with it. I use the Adobe Camera Portrait profile in ACR / Lightroom. I like how it renders skin tones with the Nikon files, but I have to pull down the warmth sometimes. Other than that, I really think it mostly resides in the quality of light and getting a pleasant white balance. Excellent post really. I come from a large illustration/digital matte painting background and have always been interested in these kinds of touch ups. Thanks a bunch Neil! Do you convert to jpg using camera raw/lightroom or something like nikon’s capturenx? Reason I ask is that although camera raw/LR has the camera profiles now, I find that nothing compares with the .nef opened in Nikon’s own software. I do exposure and white balance in viewnx (don’t have capturenx) then export for final edits in photoshop. Michael .. I’ve tried NX on a few occasions and every time reeled back in frustration with how slow a program it is. 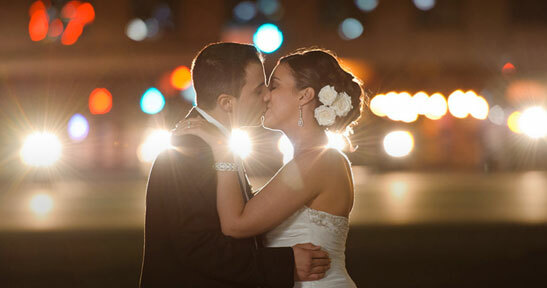 For my work as a wedding photographer it is just too slow. A fantastic article (again) with plenty of takeaway ideas for all parts of the workflow. I note that you utilise a lot of add-ins here rather than using many of the in-built standard functions within Photoshop. Do you find the results from the add-ins to be notably better than anything that can be done with Photoshop standard tools or do these simply make your workflow quicker? If the latter, roughly how long would you consider too long when working on a single portrait like this (granted, this is a fairly subjective question) and if use of standard tools in Photoshop is just time-consuming, what about using the Actions function to speed up and simplify? Matt … these plug-ins and actions are easy-accessible shortcuts in getting to a certain desired look for the photographs. And as far as something like Portraiture goes, I wouldn’t even have the faintest idea where to start creating that effect from scratch in Photoshop with the standard tools available. It’s just easier and cheaper for me to pay the $$ for the software and get on with the job. Thanks for the detailed tips…I purchased a couple of the plugins you used through your link. Love your site, and your book on on-camera flash…I’ve referred to it many times in the last year, and love the freedom on-camera flash gives me, and the natural-looking results. A big thank you to everyone for their kind comments here. Always appreciated! Your site is one of most precious finds! You give so much, and I’m learning a great deal. 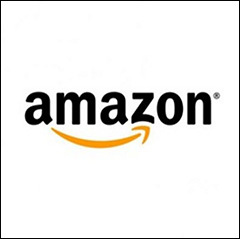 Although I absolutely love Lynda.com, Chris Orwig, and Zack Arias, your site just gives that little “extra” for beginners like me!! 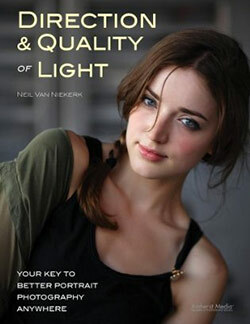 I was looking into Portraiture when I ran across Portrait Professional. It is really simple and amazing to me. It combines skin smoothing, shine reduction, and an amazing transform function into one fairly automated program (all the features can be tweaked or disabled, so it is very easy to adjust to taste.) If you’ve given it a try, I’d love to hear your likes and dislikes about it. It sounds like a bargain at $99… But I have yet to try it. A try before you buy would be nice. I wouldn’t say Portraiture is “way over-priced”. 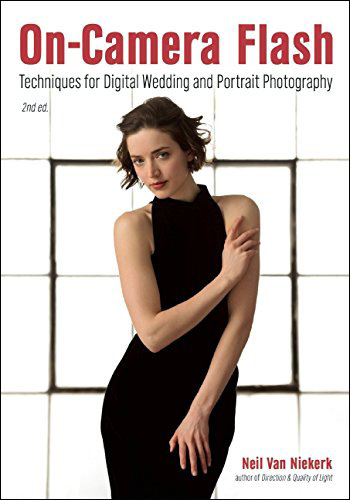 It has saved me hours upon hours of frustrating work in retouching images. Especially in boudoir photography. The first time I used the Portraiture demo, I very happily paid the full price for it. It might seem a hefty fee for a photographer working on the occasional individual image … but when you have to churn through a large number of images, then it makes life really easy. Hi Neil, do you create your own camera calibration profiles for LR, or do you use the default profiles as a base. i use a D300 and i find the color shift can be very different especially in skin tones. Dominic .. I use the Adobe Camera Portrait profile. But I do change my contrast and so on away from the defaults. I used Portrait Professional for 2 years, and upgraded to their pro version which works on RAW files. But many times, it would give a green cast to the images. i turned everything off and it still make this sickly green cast. I emailed the company and they asked me for images, and I sent them – then nothing. Its been 9 months and never heard a word back from them – much less any update to the program. I stopped using it completely. It can do some ugly things to people’s mouths, and bone structure and eyes, and its easy to overuse. The newer version is slow to use too. What I am pretty happy with now, is PS’s healing tools, then using Nik’s software Dynamic Skin Smoother in their Color Efect Pro – it allows you to select the skin tone and fine tune it a bit. Then some custom actions based on magazine articles. I also bought some dvd’s on retouching and learned how to use PS tools to do a lot of retouching and that gives me more control. After you do it 100 times, you get pretty fast at it too. Great article. The entire site is really priceless for the amount of information you share. Quick question with regards to Shine-off, are you using it in 64-bit mode? I can’t find a lot of documentation that mentions it. I appreciate the help and the website. Thanks. Randy, you know .. I have no idea. I use it in the default mode. Thanks for being so open and sharing all this info’. For anybody else interested: I have been using Nik Software Color Efex Pro 3.0, and there is an effect called Tonal Contrast that very closely mimicks Topaz Adjusts Detailed effect, to my eyes. You can substitute Topaz Adjust in the blog article above for Nik Software Color Efex Pro 3.0 Tonal Contrast and achieve similar results. Im using PS CS5 on a MacBook Pro and followed the installation advices (install plugin in folder “…/Applications/Adobe Photoshop CS5/Plug-ins/Filters”). But the plugin doesn’t show up in the filters menue inside of PS CS5. Shine off for the Mac is written as 32-bit code. Photoshop CS5 for the Mac runs in 64-bit mode, so you cannot see the plug-in in the filter menu. You would have to right-click on photoshop.app and select the option to run it in 32-bit mode to be able to see the filter. FYI – All Image Trends plug-ins including ShineOff now support 64 bit on both Windows and the Mac. Since I discovered your blog, I’m always here :) Great work so far. Looking forward to your future articles. When you import your RAW files into Lightroom (if you do that), I know that LR makes a few default changes to brightness, contrast, etc. Do you clean these settings (i.e. apply Zeroed preset – i don’t remember the exact name) before you start to work on the RAW file? I use my own (non-zeroed) settings as my default. I am a newbee from Singapore and i learned a lot from your website specially the entries from your Tangents. I already bought your book on ‘On Camera’ flash but still could not get the ‘Off Camera’ flash. According to the bookstore they place the order 3 moths back. It is exactly what i want to learn at this stage. 1. 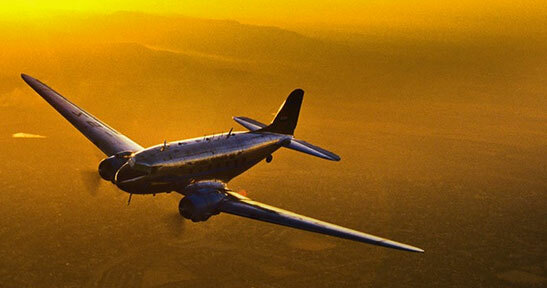 Do you use or advice to use any mask from the shine-off, potraiture and topaz steps? Will those steps not affect other parts of the picture? 2. In your last step when you add B&W set to Overlay, which version of the photo did you use (i mean from which step)? 3. The Portraiture plugin price is a bit too high, is it OK to use Topaz Clean? It does have some feature on smoothing the skin and the price is reasonable. Will it achieve the same thing? 1. 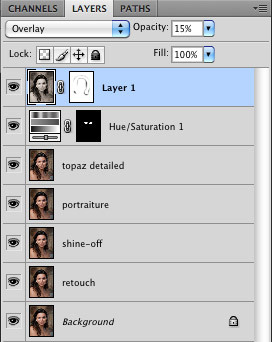 Any layer masks applied to a layer, will affect the layers below as well, dependent on the opacity of that layer. 2. For that final steel with the Overlay, I copied all the layers that provide the final image (at that point), and flattened those copied layers, to give me a “final” layer. I did some further work on this, such as that Overlay. 3. I haven’t done a comparison with Topaz Clean. But if it provides some skin smoothing, it will have a similar effect in the final image since the skin smoothing layer is just one step here. Shine off is a plug-in that only works on wet skin. It does not correct bright areas of skin caused by overexposure. Shine Off doesn’t help for over-exposure, but it really does help for shiny skin, where you have that kind of specularity to it. It really saves me time in the editing of images. Hey Neil, I’ve noticed a few references from you about shine off plugin, i was going to try it out but wasn’t very impressed by the example pics, i have a similar technique which is much faster and gives what i feel is the same if not better results and is non destructive, you use the adjustment layer selective color and choose the option whites from the drop down and then adjust the bottom slider for black level, this is basically photoshops version of highlight protection but it will only apply to highlights, I was wondering if you have ever used this technique and in your opinion how it compares to the shine off plugin? I like working on a separate layer for some things, such as adding an effect from a Photoshop plug-in, because then I can pull down the opacity. I rarely save the PSD files though. Only if it is an image that I know I might be revisiting in future. what format do i need to take my pictures if i want to edit my pictures on LR? You can take both RAW, Jpeg to edit in LR, but RAW most definitely give the better result with its retention of data, as jpegs are compressed and data thrown away in camera when shot like that. Generally the RAW format of your camera is best. Hello Neil, how selective are you with applying plugin effects to your images? For instance, do you let Portraiture apply its result to the image globally? Or do you create a mask and restrict Portraiture to certain areas only? My workflow is I create a layer mask where specific areas of the image gets processed by Portraiture or some localized sharpening. The step that consumes most of my time is hair selection and I wish there was a way to speed up that. How do you handle hair? I run Portraiture in its default mode on a separate layer in Photoshop. Then I pull the opacity down for that layer – adjusted to taste, but usually around 30% or so. I don’t mask the hair or anything like that. I often mask out the eyes and eyelashes if I feel I have lost crisp detail there. But the hair – that doesn’t really concern me.